Lack of earthshattering bass -- not a weakness of this speaker, but simply a weakness of 99% of all small form-factor towers. **NITPICKY** Slightly cheesy plastic spike feet. Grills are tough to get off -- Klipsch's reference series and several other manufacturers use magnetic grill covers. These push on to studs in the front baffle. The terminals are very nice, but the bi-amp straps are easy to dislodge unless you are using banana plugs with the terminals screwed all the way down. I just picked these up yesterday to replace my aging DLK Model 1.5s which I've had... forever. I am "pretty" impressed with these speakers. The do just what you'd expect out of a speaker this size, and sounded considerably better than any other speaker in this price range that I listened to with the exception of the Klipsch RF-25. The RTi8's sound different - obviously - than the horn-loaded RF-25s, but I'd say they overall sound just a touch better. Better imaging and depth is conveyed very well by these speakers. In the Spousal Acceptance Factor area, these are much better than any other speaker in this range. REAL cherry veneer on every face of these speakers except the front just isn't an option on most towers in this range. You can also really tell the build quality is fantastic. Other sound stuff -- well, duh - these are loaded with a pair of 6.5" woofers, so you're not going to get the same low frequency response as a speaker with a couple 10's or 12's. But what you do get is very tight, accurate bass. The low end rumble that these speakers lack is a void easily filled by any number of competent subs out there today. Honestly, folks, it is A LOT easier to fill a hole in the bass department than it is to find a speaker which sounds great on vocals, all sorts of instruments and movie soundtracks, which these do. In terms of comparisons with other speakers, I really did prefer these to any of the Boston Acoustics VRs I listened to, which are all for some reason lacking that signature Boston top-end crispness these days. I also listened to several Canton models at sometimes triple the price. What those speakers make up in Low end, they lack again in mid-high clarity and efficiency... MAN are those dogs! Again, in terms of closeness of sound, the Klipsch RFs (25s in particular) are close in price and overall sound quality. The Klipsch's are much more in your face, and these are more airy and with better imaging. I'll be interested to keep listening critically to these speakers - they are a real treat thusfar. Excellent value. Entry-level audio-phile grade speakers at a fraction of the cost. Of course there are better speakers out there, but NOT for the money. They sound wonderful on acoustical music. Extremely open, airy, and natural. It sounds as though the guitar is in the room with you. Absolutely none for the money! Excellent speakers for the money! I listen to mine every single day. I worked at Circuit City, so I got a rediculous deal on them, but they're still a steal at the retail $700. I listened to pretty much every speaker available to me here locally including speakers from Sonus Faber, Martin Logan, and Thiel. For their lowest priced models, (that were still often more than 2x the price of the RTi8), there was just not that much difference to justify the added cost. The ML's bass was very similar with a 8" woofer. They sounded slightly more open and airy, but had fairly bad issues with reflection due to their electro-static design... So you'd had to have some sort of dampening behind them. It created a sort of echo at some times and then a noticeable cancellation at others, Yuck. 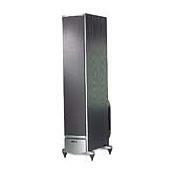 The Sonus Fabers didn't impress me any more at all for their cost (do NOT like their cabinet either). The Thiels were very impressive, with fairly better width and detail, but the difference in sound was NOT worth the difference in price. The RTi8s are simply a remarkable value. They have incredible clarity, detail, width, and range. I'm not sure what the other reviewers were expecting to get out of these speakers bass-wise. Give me a break! They have two 6.5" drivers. If I turn the bass on my HK all the way up, pop in a bass CD, and turn off my CSW-10, they still have enough bass to rattle the dishes in the kitchen on the other side of the wall! What more are you expecting from a passive tower?! Now, it did take the better part of a month or maybe even slightly more before they produced that much bass, but they have quite a bit for a passive tower with two 6.5" drivers. With some very heavy bass songs and the bass all the way up, the drivers must come close to .75" Xmax without hardly muddying up the sound. Of course I don't listen to them like that, I'm much more into acoustical music and usually run them with an 80Hz crossover and the bass at about 50%, but it is definitely impressive to see what they can do. I also bought my father a pair along with RTi4s for rears and a CSi3 for the center. They perform equally as incredibly on movies. He is using a simple Onkyo TXSR502 with heavy-guage zipchord and the clarity and detail blew me away when watching the final battle scene in LOTR. I'm sorry to bring down these speakers but I have been unimpressed with their performance the etire 6 months I have had them. Their clarity and imaging is fine. Polk had done a good job of not pressing the bright sound of say a Boston Accoustic tower and not falling into the muffled sound of lesser expensive JBL towers. The problem here is a lack of a low range. I tried these speakers on several setting, in many positions, and with three receivers and I was never able to get any significant low end. As a person who likes to listen to music in two channel these speakers leave me wanting more, but for home theater applications they are great. The sound is very clear. The build quality is excellent. I use them both for audio and video and they perform well. They really have good bass but not really thunderous. I can not in all fairness say that this is a weakness. Build quality. Sounds like a speaker costing 3-4 times as much. Good bass, not great. A good sub (I use a Polk 505) makes this world-class! Very well built floorstander. Real wood veneer in either cherry or black oak. Great imaging, soundstaging and front to back depth of stage. Good bass, not great but very useable and satisfying. Ive owned these for 3 months now,and I am very pleased.I traded in a pair of Boston Acoustics vr970 lynnfield's,the I thought the Boston's were whatI wanted,They were very warm,but on older rock cd's they had no punch,so I moved back to Polk.The rti8's are fairly warm on mild recordings but when I throw in the rock thats when they really shine,their a great balance between different types of music.The rti8 is far from an audiophile speaker,but their far from a harsh loudspeaker too,I think their a great deal for around $700 a pair,a sub is not a bad idea,Im old school so I dont need a BUNCH of bass,but I do run a 10" Velodyne with them...BTW I would highly recomend the 8's over the rti10's.I listen to them both side by side other than a hair more bass,the 10's are just not that much better to justify the exta$$$,now the 12's,thats a diffent story!One other thing,I put on the best of ELP,theres a part in Fanfare for the common man that has some bell like tones...twice I answered my door,thought the door bell went off,I never heard that in my last two pairs of speakers,that includes the vr970's.